WAIST HIGH: Happy 25th Birthday Rio. Recorded in the spring of 1982, going gold in the US in March of 1983, and platinum in April, Rio eventually reaching double platinum status. It peaked at number 5 on the Billboard Hot 100 and remained on the charts there for 129 weeks. 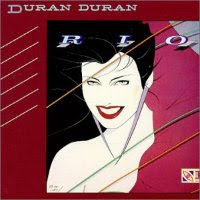 EMI in Britain had promoted Duran Duran as New Romantics, but that genre was barely known in the United States, and Capitol was at a loss about how to sell the band. The band however, had their own plans and ambitions for promotion. They reunited with director Russell Mulcahy (who had directed the music video for their first single "Planet Earth") and planned the release of a full length video album -- eleven videos for the best songs off of the Duran Duran (released in 1981) and Rio albums. The band traveled to Sri Lanka and Antigua between tour dates to film the memorable videos for "Rio," "Hungry Like the Wolf," and "Save a Prayer." In 2000, Rio was ranked #98 in Q magazine's "100 Greatest British Albums." In 2003, it was listed at #65 in the NME "100 Greatest Albums Of All Time." In 2004, CMJ ranked it as #1 in their "Top 20 Most-Played Albums of 1982."